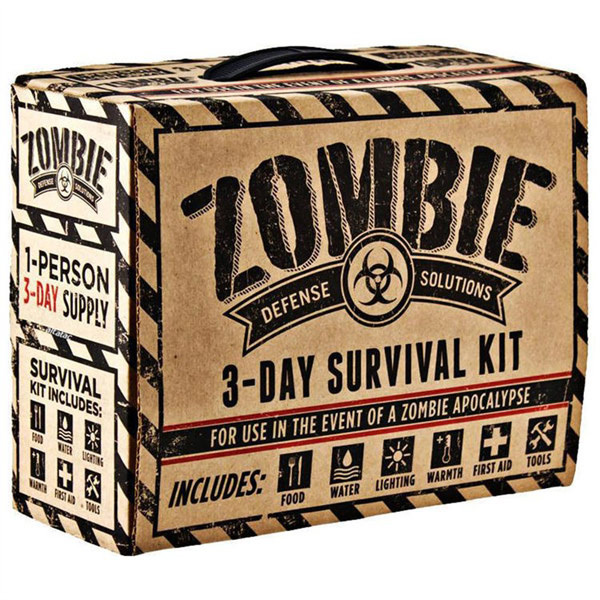 Back in 2012, the CDC launched an experimental new campaign called “Zombie Preparedness.” It was a marketing stroke of genius applied to the laudable and very real cause of disaster preparation, something most worthy of inclusion in our Applied Pop Culture section. By taking a subject that’s boring or uncomfortable for many and dressing it up in the language and clothes of zombie pop culture, the CDC were able to dramatically boost public interest in the subject of emergency preparedness. An integral part of the CDC’s educational campaign was a list of recommended emergency supplies. Whether as a direct result of this or not, a number of companies have been putting out “zombie survival kits,” a natural extension of the CDC’s original idea. Even without the CDC’s campaign, it’s something that was bound to happen sooner or later. 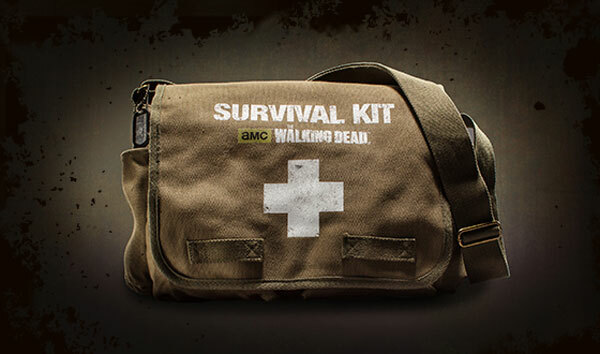 The newest one of these is an officially licensed AMC’s The Walking Dead survival kit that was just announced a few days ago. It isn’t out yet but disaster supply company First My Family is taking advance orders. Although these are all called “survival kits” by their makers, with varying degrees of seriousness, they are definitely not equal in quality. And so, in the interests of zombie apocalypse survival, here’s Pop Mythology’s half-serious/half-playful review of the zombie survival kits currently available for purchase, using the CDC’s guidelines as our standard. Enough water. Only contains 6 pouches with 4.227 ounces of water. The CDC recommends a gallon per person per day (remember you’ll be doing more than just drinking it). Proper first-aid kit. Bandages and alcohol wipes are fine but a first aid kit also needs basic, commonly used medication like aspirin and Pepto Bismol among other things. Matches. While potentially useful, matches are more of a subsidiary item depending on the type of disasters that are most likely to strike your region. Lightsticks. Again, potentially useful but not the most urgent, and in a portable kit that one can carry, one has to cram only the most urgent items. Survival hammer (for breaking windows and maybe some zombie heads). Same issue as the two items above. All three smack of a certain survivalist romanticism. There are lots of other items you’ll be needing more urgently than these. It’s got a few useful things in it. This could serve as the beginning of a fully-equipped kit but by itself won’t cut it. The exact same items are also offered by a different company, Zombie Defense Solutions, in a different package. Food, water, flashlight, blanket, etc. Fish hook, line and spool. Again, survivalist romanticism. What are you going to do with a fish hook and line in the city? Gum. Maybe I’ll eat it for breakfast since I don’t have any food. Tea. Top of the morning to ya! Care for some tea? Pencil. I think I’ll just stab myself with this and let the zombies take me now. Okay, so as a cute and fun novelty gift this is fine, and I’m assuming that’s all the makers intended it to be. It could be a cool extra something to give your kid to get him more interested in the importance of disaster prep. Just make sure you have a real kit ready also. The other three or four knives beyond the one that’s already more than enough for any emergency purposes. An axe. A machete. Oh, and look, a bigger machete. Absolutely, bloody useless unless you’re a hockey mask-wearing psychopath. A clever if shameless marketing tactic by Gerber (the blade company, not the baby food company), this really shouldn’t be called a “survival kit,” not even as a gimmick. 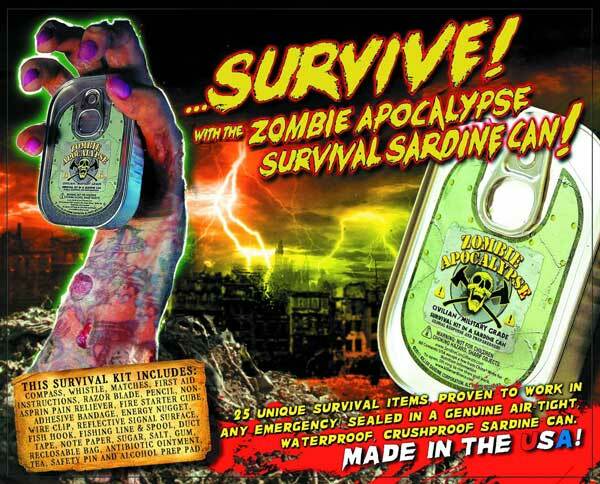 I’d prefer “zombie battle kit for conserving your ammo” as a gimmicky name—at least that way they’re not fooling anyone. I mean, there’s nothing wrong with buying a bunch of knives if you want to. The thing is, some folks out there who think the zombie apocalypse is really coming might spend their money stocking up on stuff like this instead of enough of the truly necessary items. Enough food and water. Realistically, of course, no portable all-in-one kit can provide the amount of water that the CDC recommends. One must add and supplement. But I suppose in a real emergency situation two people could get by for a few days on what’s provided here if they’re conservative. Official AMC’s The Walking Dead “I Survived” patch. It’s cold and I’m hungry. Who cares. Face masks. Well, if you’re going to be joining search & rescue efforts, which is certainly a possibility, then yes, these could be useful, but as always it’s all about order of priority and these aren’t at the top of the CDC’s list. Gloves (for “moving debris,” according to the manufacturer). Like face masks, potentially useful depending on the situation. But the very first things you’ll be doing in most emergency situations probably won’t be moving debris unless you’re buried under it, in which case you probably won’t be able to get to the survival kit that contains your gloves. Of the kits we’ve seen so far this is the most decent. It’s a good starting point to which you can add other items that the CDC recommends that manufacturers can’t provide in a ready-made package (personal documents, cell phone, cash, etc.). 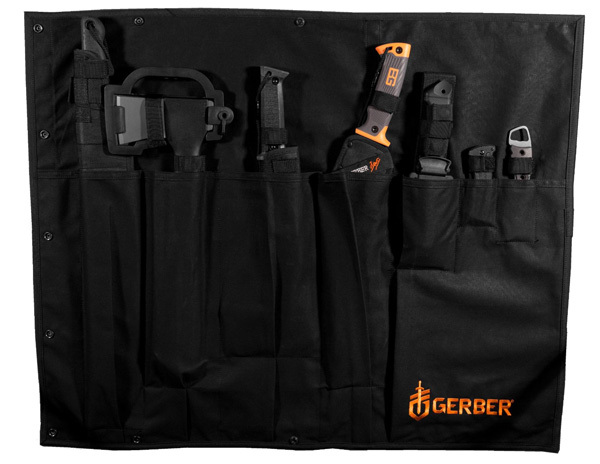 Basically, except for the sardine can and Gerber’s Michael Myers kit, the other two kits above can be decent starting points for a more comprehensive disaster prep kit. Neither of them are close to complete in themselves, however, so be sure to supplement with additional items as per the CDC’s recommendations. Keep in mind also that these are all evacuation kits, meaning they only provide enough food and water—if they provide any at all—for 3 days outside or on the road for one person (two people for the Walking Dead one). The CDC recommends that for holing up at home during an emergency situation, you should stock up on at least 2 weeks’ worth of food and water per person.